D.m. gracilis dan D.m. maculatus. 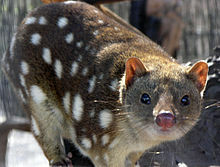 The tiger quoll (Dasyurus maculatus) is a carnivorous marsupial of the order of Dasyuromorphia. It is also known as the spotted-tail quoll or the spotted quoll. It is mainland Australia's largest, and the world's longest carnivorous marsupial. This page was last changed on 18 July 2015, at 18:35.